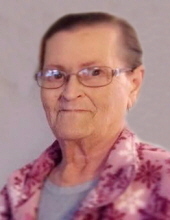 Virginia Carol Mitchell, 78, of Nevada, passed away Thursday, February 7, 2019, at Mary Greeley Medical Center in Ames. A private graveside service will be held at a later date at Collins Evergreen Cemetery in Collins. Virginia was born on October 3, 1940, in Collins, Iowa the daughter of Lyle Elmer and Lota Viola (Link) Luing. On June 10, 1961, she was united in marriage to Clarence Mitchell at the Christian Church in Collins. Virginia had worked for Donnelly’s Marketing in Nevada and retired from Green Hills Retirement Community in 2004. Virginia is survived by her husband, Clarence of Nevada; her sons: Tony Mitchell of Nevada; Jeffrey (Trish) Mitchell of Nevada and Scott Mitchell of Rockford, IL; her sister, Georgina (Sherman) Stole of Ostrander, MN; her grandchildren: Shelby (Lenae) Mitchell, MadaLinn, Ross and Paiten Mitchell, Cassandra and Aaron Wray; and her great-grandchildren: Brogan and Bryson Bennett and Thayer Mitchell. She was preceded in death by her parents; and her siblings: Lyle “Bill” Luing, Betty Post, Norman Luing and Elsie “Geri” Littrel. To send flowers or a remembrance gift to the family of Virginia Carol Mitchell, please visit our Tribute Store. "Email Address" would like to share the life celebration of Virginia Carol Mitchell. Click on the "link" to go to share a favorite memory or leave a condolence message for the family.